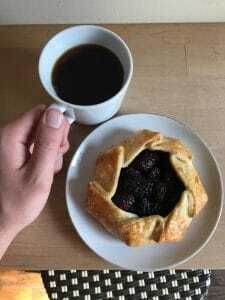 August Is Blackberry Month at Village Baking Company | Village Baking Co. When the calendar changes, we do too (a little bit anyway). Peach month was great, but now we’re welcoming in a berry good friend of ours — blackberry! Blackberries’ sweet and tart flavor profile make them a great addition to items with a creamy texture. Pastry cream, whipped cream, frangipane — they all make welcome homes for our August feature. We even found a way to work these seasonal berries into a sandwich. Today on the blog, we’re going through some of the blackberry creations that have our boulangeries buzzing this month. We swear by our squares. The croissant square is such a great breakfast package. You get the texture of a croissant with the creamy profile of pastry cream. 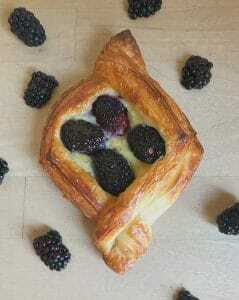 Maintaining balance in the pastry are the blackberries, which add a needed, tart dimension to the experience. Sitting beside a hot cup of coffee, this is the way to start your day. Fruit pies are a staple of summer: jamy fruit and a golden crust, juiciness and flakiness balancing one another perfectly. Our fruit galettes are like delicious single-serving pies. A shortcrust pastry base creates a little home for a mountain of delicious fruit. If you’re in search of a dessert that is quintessentially summer, a blackberry galette is for you. Blackberry Jam and Prosciutto, Do We Have Your Attention? 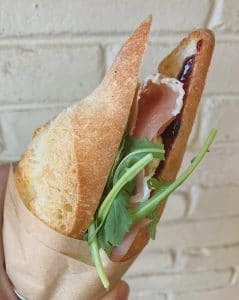 If you’re a sandwich fan and longtime boulangerie connoisseur, you’re no-doubt familiar with our prosciutto sandwich: prosciutto, Camembert, arugula, and fig jam on baguette. We’ve brought this favorite back for August, but we’ve replaced the fig jam with blackberry jam. It’s sweet-salty-savory satiation you can carry with you. If you enjoy a nutty flavor profile, almond croissants are essentially peak pastry for you. It doesn’t get any better than rich frangipane dripping from between two layers of warm croissant (a la Monday’s Instagram pic). Or does it? Blackberries and blackberry jam add a sour note that perfectly complements the lavish texture and flavor of frangipane. At some point this month you’ll do something that will make you feel proud of yourself. 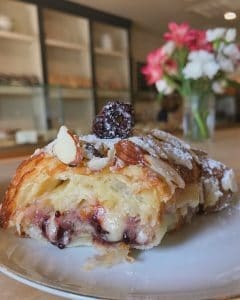 When this happens and you want a reward, treat yourself to a blackberry almond croissant. 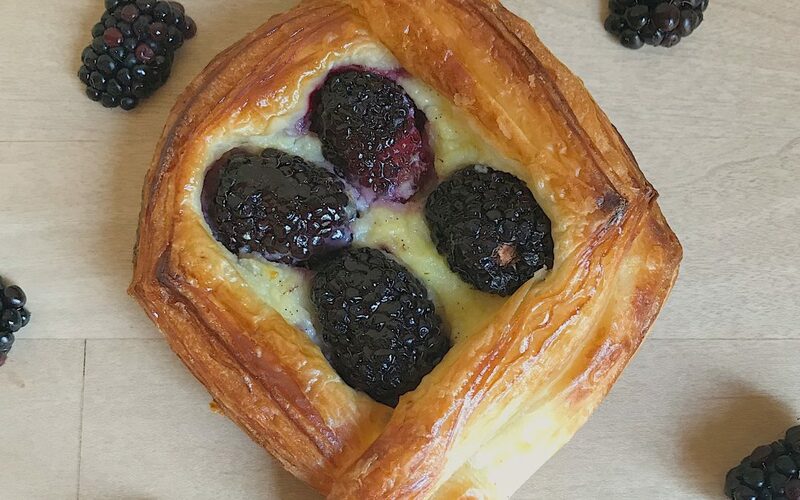 If you’ve got a thing for blackberry like we do, you can come get your fill at our Dallas boulangeries. If you’re looking for a specific item or you want to place a retail order, you can always call ahead to either of our Dallas, TX boulangeries at 214-951-9077 (Woodall) or 214-821-3477 (Greenville).